I was in Hong Kong for a day, then flew to Beijing to meet up with my pastor for a China tour. Yonghe King is a restaurant chain in China, specializing in Taiwanese-style foods. I first went to this restaurant in Beijing, and again in Shenyang. 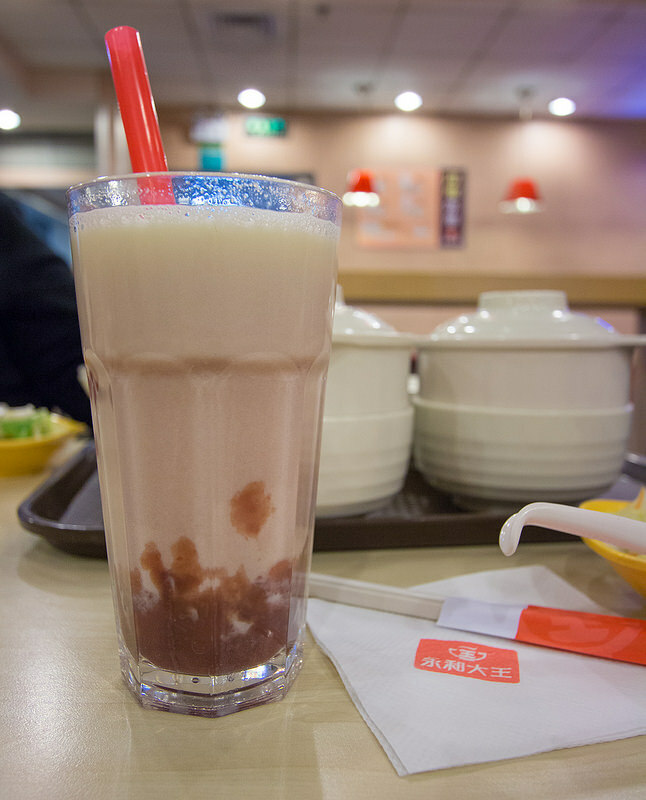 I ordered cold soy milk with red bean, everytime I went to Yonghe King! The soy milk itself is plain and unsweetened. The red bean helped sweeten the drink a bit. You also have the option of ordering hot soy milk, but I prefer drinking it cold if it’s hot outside. Yonghe King (Chinese: 永和大王; pinyin: yǒnghédàwáng) is a Chinese fast-food restaurant that specializes in noodles. The headquarters are on the fourth floor of Building B of the Rainbow Hongqiao Centre (莱茵虹桥中心) in Minhang District, Shanghai. Yonghe Dawang opened its first restaurant in Shanghai on December 12, 1995. Today Yonghe has branches throughout China, with over 70 restaurants in major Chinese cities including Shanghai, Beijing, Shenzhen, Hangzhou, Jinan, and Suzhou. In 2004, Yonghe King merged with one of the largest fast-food chain in the Philippines, Jollibee, which is owned by Chinese Filipino Mr. Tony Tan Caktiong. The original logo of the chain was that of a smiling face against a red background, which was strikingly similar to the Colonel Sanders logo used by KFC. The Associated Press stated that the former logo was “a smiling, grandfatherly Chinese man”. In 2005 the chain changed its logo to that of a steaming bowl of soup. Younge King has those too for breakfast! We tried going for breakfast in Shenyang, but they had run out of soy milk.. So we went to McD instead.